There’s been a revolution in microwaveable meals. Gone are the days of bland, rubbery, overcooked food. Now, you can get delicious, Italian style meals straight from the microwave with the new Barilla Microwaveable Meals. Whether you’re at work or just busy running errands, sometimes it’s hard to find the time to prepare a solid meal. In one minute, you can have a gourmet tasting, perfectly prepared pasta penne with Barilla Microwaveable Meals. Available in 5 tasty varieties, including two whole grain options – from Mezze Penne with Tomato & Basil Sauce to Whole Grain Fusilli with Vegetable Marinara Sauce, Barilla Microwaveable Meals provide a filling meal in just 320 calories or less. Even better, all of the dishes have 9-11g of protein and are a great source of fiber, iron, and vitamin A. When I get caught up on a conference call or am in the middle of coding, I like have a meal option that is both tasty and easy to prepare. And Barilla Microwaveable Meals are definitely easy to cook. First, you carefully peel back a corner covering the pasta sauce. They have a handy dotted line so you know just how much to peel back. Next you microwave for 60 seconds. 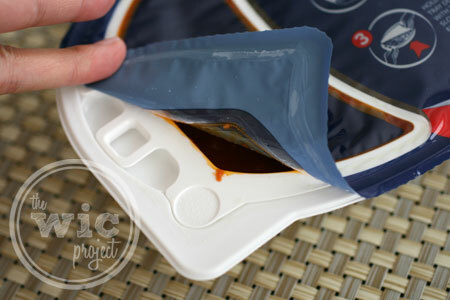 After it’s done heating up, carefully peel back the rest of the blue plastic cover, making sure you hold down the sauce dish so it doesn’t pop out and spill. 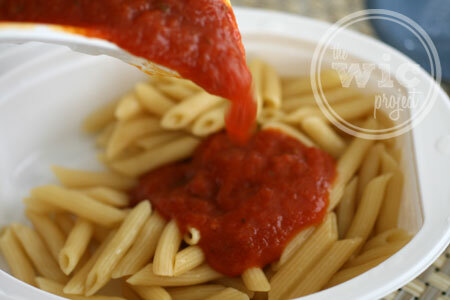 Then, you top your pasta with the sauce – add as much or as little as you want! I thought the Barilla Microwaveable Meals were delicious. I was amazed how every piece of pasta came out perfectly tender and the sauce is awesome. I never would’ve guess that this was a microwave meal if I hadn’t heated it up myself. Barilla Microwaveable Meals are an easy and healthier way to “grab a bite” when you’re short on time. It isn’t fried, it isn’t greasy, it’s just 100% natural ingredients combined to make a home-cooked tasting meal. If you want to try the new Barilla Microwaveable Meals, make sure you download this coupon to save $1 off Barilla Microwaveable Meals. Barilla Microwave Meals are available in grocery stores nation wide, retailing at ~$3.29 per package. Barilla microwaveable meals deliver the Italian taste and quality people have come to expect from Barilla – Italy’s #1 brand of pasta – in a single serve offering. Made from the same 100% natural ingredients as Barilla dry pasta and jarred sauces, they are shelf stable, portable and ready in just 60 seconds. One winner will receive a 5 free Barilla Coupons for the new Barilla Microwaveable Meals! Disclaimer: I wrote this review while participating in a blog tour by Mom Central Consulting on behalf of Barilla and received product samples and a promotional item to thank me for taking the time to participate. I’d most like to try Spicy Marinara! I would like to try the whole grain vegetable marinara. Thanks for the chance to win these coupons!! I would like to try the Mezze Penne with Tomato & Basil Sauce. The tomato and basil sounds delicious! I would love to try the Mezze Penne w/ Tomato Basil Sauce..I love tomato and basil! I’d like to try the Tomato and Basil flavor. Whole grain vegetable marinara. Yum! I would love to try Tomato and Basil! I want to try the Penne with Spicy Marinara. I’d like the Whole Grain Fusilli with Vegetable Marinara Sauce. Thanks. I would like to try Barilla’s Mezze Penne with Spicy Marinara Sauce microwave meal. I would like to try the Whole Grain Vegetable marinara! their spicy marinara sounds yummy! I like the mezze penne in Tomato and Basil. whole Grain Mezze Penne with tomato & Basil sauce. Oh, I’d love to try the Tomato Basil! I want to try spicy marinara first. definitely the whole grain fusilli! I would like to try the Mezze Penne with Tomato & Basil Sauce – Thanks! Love any pasta with marinara! I’d like to try Spicy Marinara! I’d like to try the Spicy Marinara! The Whole Grain Tomato and Basil looks good. I think I would like to try the Whole Grain Fusilli with Vegetable Marinara Sauce! Whole Grain Fusilli with Vegetable Marinara Sauce sounds like my kind of meal!! Thanks! I would really like to try their Whole Grain Mezze Penne with Tomato & Basil Sauce. I would like to try ‘Marinara’ looks yummy! Tomato & Basil sounds good. I would like to try the Whole Grain Mezze Penne with Tomato & Basil Sauce. Mezze Penne with Spicy Marinara Sauce sounds delicious! I’d like to try the Penne Pasta with traditional marinara sauce. YUMM!!! I cannot wait to try the Marinara! I think the one with Penne and Basic sounds great as well. Whole Grain Fusilli with Vegetable Marinara Sauce sounds yummy. I’d like to try the spicy marinara. I’d like the whole grain vegetable marinara. Thanks for the giveaway. I’d like to try Mezze Penne with Tomato & Basil Sauce. I would love to try the Mezze Penne with Tomato & Basil Sauce! It looks so yummy! Id like to try The Tomato and Basil! I think the Whole Grain Fusilli with Vegetable Marinara Sauce sounds lovely. Fusilli with Vegetable Marinara Sauce! Yumm!!! I would love to try the marinara! I Love Barilla Pasta it taste like homemade. I want to try the spicy marinara. I want to try the Whole Grain Fusilli with Vegetable Marinara Sauce. Mezze Penne with Traditional Marinara is my Barilla of choice! I’d like the Whole grain Penne with Tomato and Bssil. I want to try the mezze penne with tomato and basil sauce! I’d like to try the Mezze Penne with Spicy Marinara Sauce.